In this weekly feature, we’re profiling the unsung heroes of hip hop music: the producers. These musicians, responsible for creating beats, sampling and collaborating with MCs, slave away behind the scene while rappers get most (if not all) of the credit. With Behind The Boards, we’re looking to shine the spotlight on the best producers in the game. Next Tuesday, Schoolboy Q will release Oxymoron, perhaps the most anticipated hip hop album 2014's seen so far. Among tracks produced by Pharrell, Mike Will Made It and members of TDE's in-house crew is "Break The Bank," a raw slice of hypnotic boom-bap produced by West Coast veteran The Alchemist. One of the hardest-working producers in the industry, The Alchemist (or, to some of the younger rappers he's worked with, "Uncle Al") has collaborated with a collection of artists that spans eras, regions, and styles, connected only by the producer's back-to-basics approach to beatmaking. Follow his rise from teenage rapper to A-list producer below. Born Alan Daniel Maman to Jewish parents in Beverly Hills, The Alchemist quickly began rebelling against his suburban upbringing in the form of brash rapping. Running with a crowd that would also produce several members of Crazy Town, Maman eventually befriended a young Scott Caan (son of actor James Caan) and under the respective names Mudfoot and Mad Skillz, formed a hip hop duo called The Whooliganz. The duo attracted the attention of Cypress Hill's B-Real, who invited them to join his crew The Soul Assasins, which also included House of Pain. Touring with Cypress Hill and signing to legendary NYC label Tommy Boy Records, the teenaged duo were quickly rising, so they decided to jump in the studio and record an album. They released the single, "Put Your Handz Up," which was produced by DJ Lethal of House of Pain (who'd go on to join Limp Bizkit), but it failed to get substantial radio play. Underwhelmed by their new signees, Tommy Boy shelved The Whooliganz's album and dropped them from their roster. Watch the video for "Put Your Handz Up," filmed when Maman was 16, below. "He was real intimidating... So I just played my role. We made a lot of money together and I used to sleep on his couch in my high school years. Make funky rap beats for Cypress Hill and smoke mad weed. It was fun." Today, Maman describes Muggs as his "big brother," and with the level of mentorship he received, that level of respect seems perfectly reasonable. After helping co-produce a few Cypress Hill tracks, Maman was ready to venture out on his own, hooking up with a childhood friend Michael Perretta (AKA Evidence) and making tracks for his new group Dilated Peoples. The group's first single, 1997's "Third Degree," was produced exclusively by Maman, using his Alchemist title for the first time. Listen below. Even in this early track, traces of The Alchemist's current sound are present -- the traditional beat constructed from a slowed-down drum break, a melody that consists of one simple sample, looped and tastefully sprinkled over the drums -- it's much simpler than some of the instrumentals he'd later produce, but definitely the type of track that gets a rapper's head nodding. Al would go on to produce the bulk of Dilated Peoples' major label debut in 2000, but not before he got noticed by other hip hop heavyweights. In 1999, The Alchemist would again benefit from his friendship with DJ Muggs, getting introduced to seminal NYC rap duo Mobb Deep by him. The "Queensbridge Murderers" liked what they heard from Al, so they brought him on to produce two tracks on their 1999 album Murda Muzik. Listen to one of those, the funky "The Realest," below. This partnership with Mobb Deep would not only secure Al production credits on all of their subsequent albums, but also make the L.A. native a household name in New York rap, securing him future spots on albums by Nas, Ghostface Killah, Big Pun, Cam'ron and many more. In the wake of the East-West conflict that left 2Pac and Notorious B.I.G. dead, this kind of cross-pollination between coasts was rare, and it took a thoroughly un-regional sound like The Alchemist's to break down those walls. He continued working with his friends in L.A., but did not allow his ties to his hometown to weaken his potential. Listen to one of the highlights from this period of Alchemist's bi-coastal straddling, Nas' "Book Of Rhymes," below. In 2004, after he had been consistently producing for five years or so, The Alchemist released his solo debut, 1st Infantry. It was exclusively produced by him, and boasted guest appearances by old friends like B-Real and Mobb Deep, as well as newer artists like The Game and T.I. One of the songs from that album, "Hold You Down," gave Al his first appearance on Billboard charts as a lead artist, peaking at number 47 on the Hot R&B/Hip-Hop Singles & Tracks chart. Hear that track, which features Nina Sky, Mobb Deep's Prodigy and Illa Ghee, below. Released a few months after Kanye West's The College Dropout popularized the "chipmunk soul" sound, "Hold You Down" shows Al's ability to adjust his style to fit prevalent trends in hip hop, speeding up an Al Kooper sample to form the track's backbone. Though it didn't receive as much attention as his work on classic albums like Nas' God's Son, 1st Infantry was an important step in The Alchemist's transition from hired gun to expert curator. Al's career took another giant leap when a former collaborator asked him along on tour. Eminem, who he had previously collaborated with on Tony Touch's "Get Back" in 2000, was in a hurry to find a new tour DJ after DJ Green Lantern was dropped from Shady Records, and ended up signing The Alchemist to the label. Al accompanied Em on 2005's Anger Management 3 tour, and continues to be the rapper's touring DJ to this day. Below, watch a video of Al, Em and Royce da 5'9 on Tim Westwood's BBC 1 show in 2010. As became apparent when The Alchemist began producing songs for rappers hailing from various locations around the country, hip hop was approaching a new era in which less attention was paid to regional ties. For the most part, this benefits the genre, allowing for no-holds-barred approaches to making records, but on some major label albums, the presence of a myriad group of producers can lead to a scattered, unfocused vibe. So in this age of Dropbox collaborations, Al has done the opposite, hooking up with individual artists to collaborate on entire projects together. The first of these was Prodigy's first solo album in six years, 2007's Return of the Mac. The album had barely any guests, which went against the grain of major label hip hop at the time. Together, Al and Prodigy crafted a distinct sound based around samples from the Blaxploitation era of cinema, creating an immensely satisfying and cohesive product. Check out a highlight from that album, "Stop Fronting," below. The Alchemist continued making collaborative projects like Return of the Mac, partnering with fellow producer Oh No under the name Gangrene for five releases, making another album with Prodigy in 2013 and, most frequently, working with younger artists that interest him. Since 2011, Al has released full-length projects with Curren$y, Domo Genesis, Action Bronson and Boldy James, all of whom are relative newcomers who had previously shown reverence for old-school style hip hop. This type of mentorship is no doubt beneficial for both parties, keeping Al relevant in the ever-changing landscape of hip hop, and giving up-and-coming MCs a valuable co-sign and a leg up to bigger and better things. Take a listen to Curren$y and The Alchemist's "Scottie Pippens," from their 2011 collaboration Covert Coup, below. 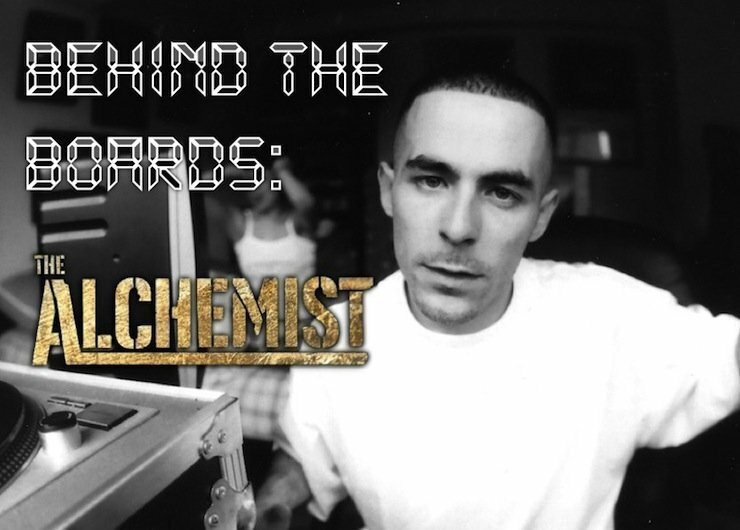 Over the course of nearly two decades working in hip hop, The Alchemist has changed the way we think about rap. He's shown us that regional ties are important for artistic development, but should never impede collaboration, that assembling an all-star roster for your album may not be as fruitful as the products of a more confined and focused studio session, and that no matter the prevailing trends, boom bap always has a place in hip hop. Check out our previous features on A-Trak and Lex Luger, and head over to The Alchemist's Zumic artist page to check out more of his music.